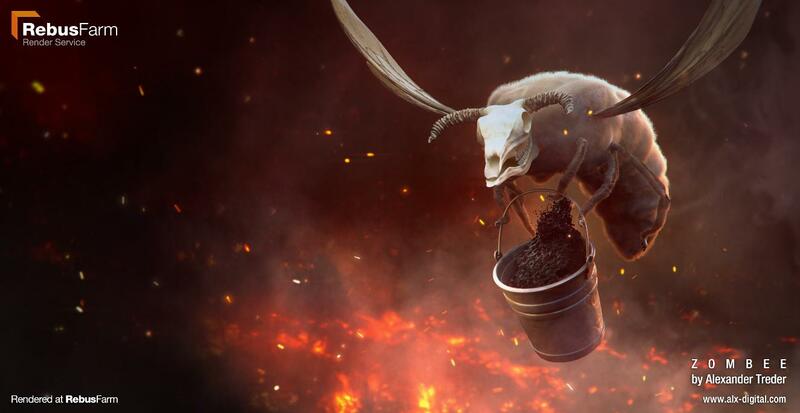 Not every 3D artist or studio has the hardware resources of a Weta Digital or Pixar, and for many the rendering stage is the most complex, time-consuming and painful part of the production pipeline. RebusFarm 2.0 cuts down on the complexity and time and ditches the pain, providing an alternative to in-house rendering that’s efficient, affordable and easy to use. Based in Germany, RebusFarm puts 3,000 Xeon CPUs equipped with 64GB RAM at your disposal, in the shape of a cloud-based render farm that supports all the major 3D applications, including 3DS Max, Maya, Cinema 4D, Modo, Lightwave, Maxwell Render, Softimage, Blender and some more. It’s accessible, with prices starting at just 2.29p per GHz hour with discounts that can reduce costs as low as 0.87p per Ghz Hour. At the same time, it can scale up to handle the most ambitious workloads. For many artists, animators and studios, using RebusFarm is a more cost-effective approach than buying and maintaining in-house hardware, and if you need more power to hit an urgent deadline, you have it on tap. Since opening in 2006, RebusFarm has been helping studios, artists and animators deliver the highest-quality work, on-time and on-budget. Now, with RebusFarm 2,0 it’s making the experience easier and more accessible than ever before. The service combines three key components, each enhanced to make using a remote render farm as simple and intuitive as using local hardware. Updated and improved for the new RebusFarm system, Farminizer is an easy-to-use export plug-in that connects your 3D application to the render farm. Artists don’t want to be bothered with changes to their workflow, so Farminizer is designed to give them control, yet make the process as seamless as possible. Now a live plug-in, it can work in the background, imperceptibly uploading data from your scene while you work. By the time you press export, many of your project files will already have uploaded. And as Farminizer checks the scene for errors before the final upload, you can pull the trigger knowing that you won’t be wasting time. The enhanced RebusDrop is an intelligent upload/download manager, controlling the flow of data to and from RebusFarm like a Dropbox for 3D rendering. 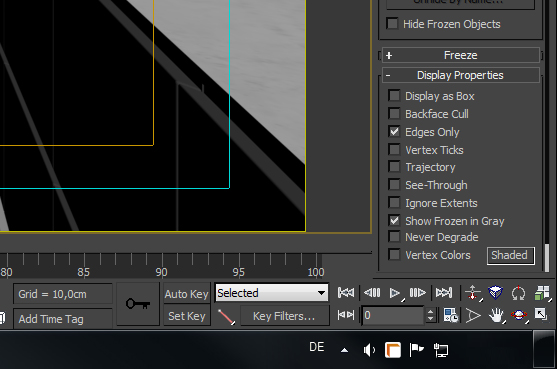 3D artists don’t want to have to wait while assets are uploaded or files synced with a server. RebusDrop works intelligently to maximise available bandwidth and minimise delays, so that it feels like you’re working on a powerful local system, not on a render farm many miles away. It maintains a smooth, constant workflow, while also providing you with useful updates about costs and project status, through notifications in OSX and Windows 7 and Windows 8. The all-new ControlCenter is a fully Web-based management interface, where you can check rendering jobs from within your browser, with continuous, real-time updates and reports. There’s no need to wait for an application and servers to synchronise, as was the case prior Rebus Manager before the version 2.0 update. Now you can check the status of your render instantly, and as it works in any browser you can do it from home, the office, or anywhere with Internet access. Take your tablet to the coffee shop, and you can still log-in and get an update on your render. What’s more, if you need more control on mobile devices, the RebusFarm app enables you to access and control render projects on the go, staring, stopping, pausing and even viewing renders in progress from your tablet or smartphone. 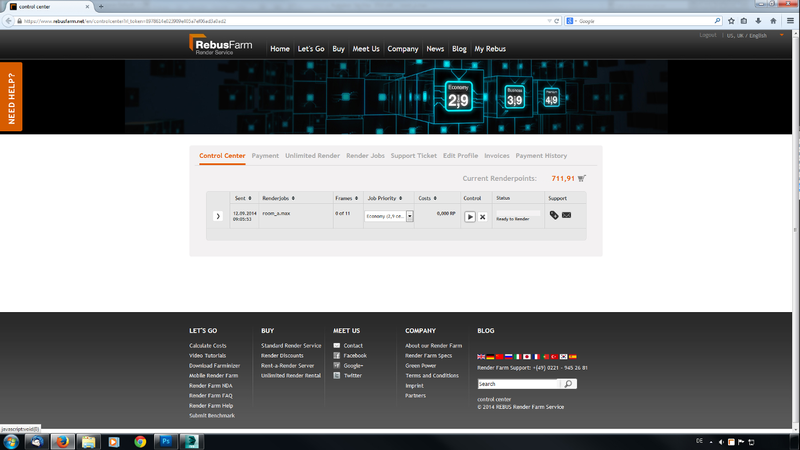 ControlCenter gives RebusFarm incredible flexibility. You can edit online jobs even if they’re still in the process of uploading. You can start, pause and cancel jobs, or check ongoing costs and status. ControlCenter even gives you the power to balance rendering costs against the urgency of your project. RebusFarm has always priorities jobs, offering three scales of service: economy, business and premium. Now, with RebusFarm 2.0 you can switch a job from economy to business, or even premium, not just before jobs enter the queue but while they’re being rendered, ensuring that if you need to hit an urgent deadline, you will. When you’re relying on a third-party render farm, you want to know that it’s secure and that it won’t let you down. RebusFarm 2.0 comes backed up by 24/7 service and support, with all connections SSL encrypted for security. All in all, RebusFarm 2.0 gives 3D artists, animators and studios the power to tackle the most demanding projects without pricey hardware investments. If you’re a larger studio, it can help you drive your costs down. If you’re a smaller studio, you can punch above your weight. 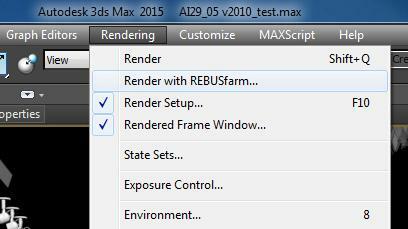 RebusFarm 2.0 cuts down on time to render, and takes the pain out of the pipeline. To find out more and sign up for a free account, visit www.rebusfarm.net. The new RebusFarm App, is also available for Android, iPhone and Windows Phone.